I learned a lot of new things this weekend. First, I learned that when Murphy set out to develop his now infamous law, he was probably thinking about camping. Not familiar with Murphy’s Law? Allow me to enlighten you. In basic terms, Murphy’s Law says, “anything that can go wrong will go wrong”. Now, I am not an outdoorsy gal. My idea of ”roughing it”, like so many other women I know, is a hotel without room service. Adding to the “charm” of this experience with that it was my very first camping excursion. We decided to share this oh-so-wonderful experience with some good friends—the kind that could make walking through the desert fun just because they were with us. That’s the good news. But from the very beginning, luck wasn’t on our side. The guys got up super early on Friday morning to reserve our spots at Squaw Creek Park, which were no longer available due to the throngs of people that also chose to subject themselves to this “fun” activity and 90+ degree heat. We are an intelligent bunch. With our camping slots unavailable, we decided to simply go to Palisades Park, as it is close and had one “buddy” slot available. At 4:00 that afternoon, and after only one trip back to the house because we forgot diapers (my brain shut off at about 85 degrees, people) we unloaded and climbed into our shiny Airstream. 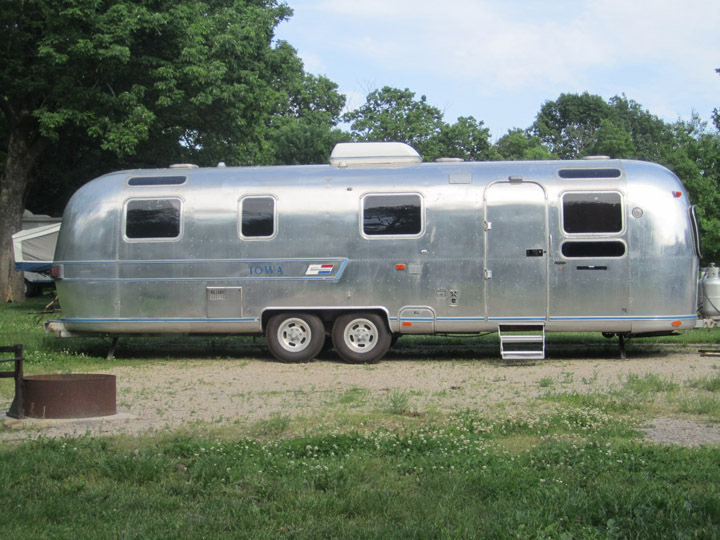 So two weeks later Joel pulls into the driveway with our 5,000 pound 35 foot roll of aluminum foil Airstream trailer. My interest in this project extends only as far as my ability to redecorate the inside to be more like home. (No thank you, 1970’s burnt orange.) But when the project was done, I have to admit that it looked pretty cool, and might be fun to get a break from life/bills/bad tv and spend a day or two outside. It’s at the peak of the day, with no water (because of a bad water pump and a still-drying-out trailer), sweltering heat and no shade, that I am regretting my earlier admission. What were we thinking? What is fun about regular life minus modern conveniences? Just then our friends realize that their air conditioning doesn’t work. Yep, sounds about right. Thankfully these are good friends and they decided to stick it out with us and hope for a cooler night. It is what it is, right? The evening went by as a blur— our 4 children + another friend’s 3 kids = 7 flesh-colored streaks running in circles, only stopping to beg for food, cry over flesh wounds or tell on someone else (more often than not Cael was doing the tattling, and WAAAY more often than not, Cael was the one being told on). But amazingly, night did come even in the heat of the park and one by one, the kids went to bed and the four of us were left to relax. Wait—what’s that? Did you hear it? Oh, never mind. It’s only the sound of the 6 different raccoons that tried to break into our campsite. Apparently the Palisades raccoons missed the memo that Murphy was crashing in an Airstream and an old Winnebago. We shooed them away repeatedly, which only instilled a new fear in me as I walked to the shower house to use the restrooms. I wonder if I could fend off a rabid raccoon with a bright light from my iPhone… is there an app for that? Our camping excursion ended abruptly as an incoming storm looked threatening on the radar. We packed up our gear and hunkered down in our campers just in time to escape the deluge of sunshine and breeziness that ransacked our campsite. With no chairs, food, etc. there was no reason to stay, so our day of fun was complete. - Toilet paper in campground bathrooms comes off only one square at a time. Completely insufficient when you’re collecting sweat in places you didn’t know you had. - My children are so pale, they are more reflective than our mirror-shine Airstream. I think they produce their own SPF. Chances are good that if you rub your kid on my kid, they’ll be UV resistant. - If you’re at all overweight, children in the shower-house bathroom will think you’re pregnant. You should be writing a book (in your "spare" mommy time!!) Sherm & I have achy sides from reading your blog!! I hear that a lot, Judy... just not sure how to make that happen, or what to say! Something to think about over the summer, huh?